As this update contains 2 weeks of changes, there are a good amount! Much of my efforts have revolved around revamping the trade system. There's still work to do, but I'm very happy with the progress. New drones UI shows various stats about worker drones. Use the slider to control how many drones can be assigned to construction or mining. This can have a dramatic effect on your economy and helps prevent mass-construction from stalling out your production. Revamped conduit placement -- click once to begin laying a path, then click again to confirm. Press escape to cancel. Overall, it should be much faster and easier to lay longer paths. This still needs a few fixes. Structures now automatically snap to a valid rotation when moved near conduits. This makes placing structures much easier overall. Can now hold left shift to place multiple copies of the same structure, making it easier to mass-produce structures. Added a delete button to bulldoze structures. Can also toggle by pressing 'del'. Added fusion power plant; generates large amounts of power in bursts that require hydrogen. Revamped trade so that different types of ships carry different types of goods. Traders can haul many different types of goods. Ships have different crew sizes and wealth, too, so poorer traders can't load up on high value goods. 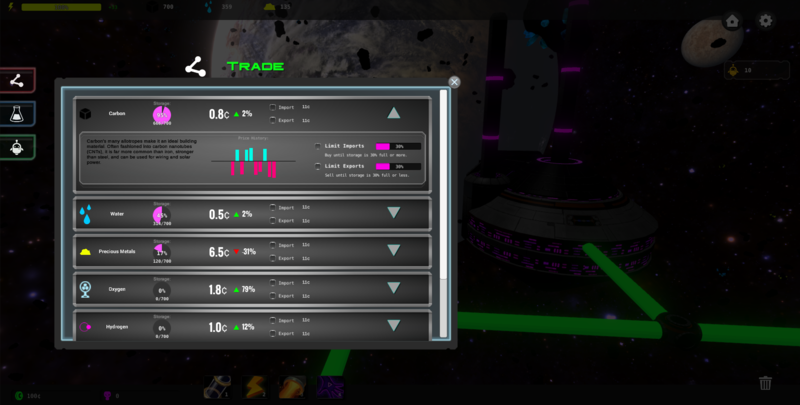 Updated trade user interface. Added a price history, more detailed lore, and an indicator to show how the good's price last changed. Revamped 'research' back into a tree structure so it is easier to see future upgrades. Passive abilities have been added as well, but aren't yet functional. The next update will focus on smoothing out persistence (saving and loading), dialing in a few lingering issues with trade, and implementing the final aspect of the economy: commerce structures like casinos and bars. Beyond that, there are plenty of things to smooth out, many new goods and structures to add, and effects to improve.